For three weekends, enjoy an unexpected experience in a Swedish sauna created by artists Bigert & Bergström, combining traditional wood-burning methods with avant-garde design. The Solar Egg has landed in Paris! Brought from the town of Kiruna in Swedish Lapland, a sauna created by the artistic duo Bigert & Bergström is being set up in the garden for three weekends. 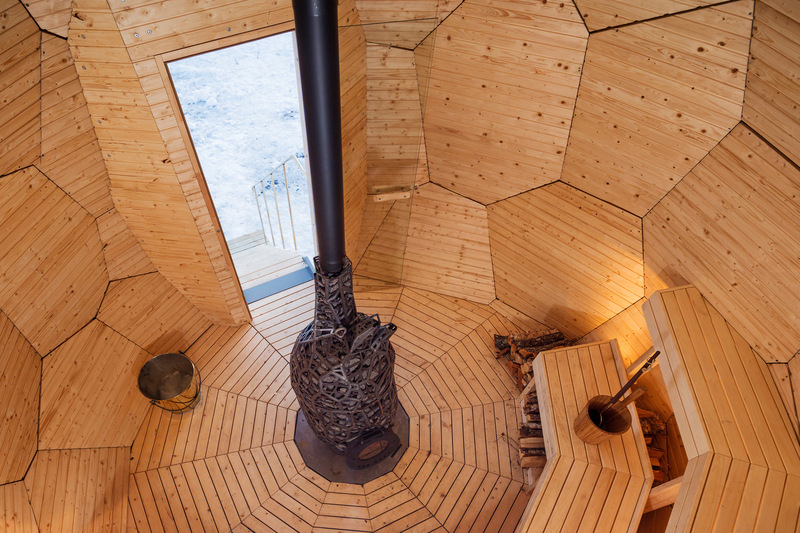 The sauna is a unique work of art in the shape of a golden egg covered in mirrors that reflect the surroundings. Its size is impressive: 5 metres tall and 4 metres wide. It takes its inspiration from the far north of Sweden, where light conditions change completely with the seasons, from round-the-clock darkness in winter to the Midnight Sun in summer. Come and enjoy a sauna experience in true Kiruna-style! Put on your swimsuit and get warm next to a fire fed by a giant heart before cooling off outdoors in the garden (using a less extreme alternative to rolling in the snow!). Fashion fact: the dressing gowns placed at your disposal for the duration of the session were created by the fashion designer Diana Orving. When it leaves Paris, the installation will return to its place of origin, where it will form part of the city’s urban redevelopment scheme. The ground under Kiruna is sinking due to mining, and much of the city is being relocated. This unprecedented project involves moving entire neighbourhoods and the old centre with its church, schools and housing. The artwork forms part of the identity of the new town, and is designed to be accessible to both locals and tourists, encouraging impromptu conversations inside its shell in the tradition of saunas. Installation designed for Riksbyggen by Bigert & Bergström. Curated by Futurniture. Sessions every two hours from 12 pm to 6 pm. Tickets (10 euros) on sale at 12.30 pm one week before each of the above dates. Event organised within the framework of Swedish Design Moves Paris.